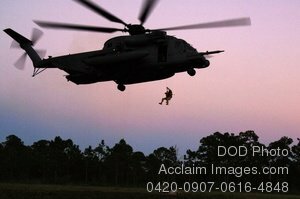 Description: Free, public domain image: Pararescueman Hanging from a Helicopter. Pararescuemen from 720th Special Tactics Group are hoisted up into an MH-53 Pave Low helicopter over the live fire ranges on Eglin Air Force Base, Fla., Oct. 15, 2007. (U.S. Air Force photo by Airman 1st Class Emily Moore.